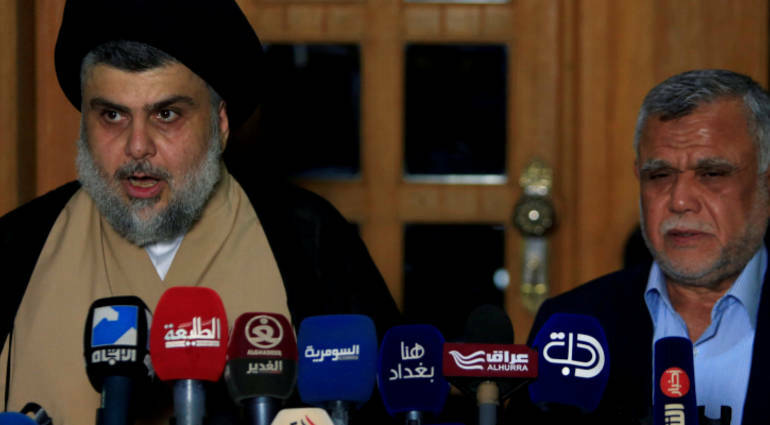 A leader in the Fatah Alliance revealed a political move led by Badr Secretary-General Hadi al-Amiri to restore the broken political relations between cleric Moqtada al-Sadr and former Prime Minister Nuri al-Maliki. The official in the coalition popular mobilization, in a press statement by the Sky Press that after the announcementof the formation of an alliance between the "conquest" led by Hadi al-Ameri and "Asron," led by Moqtada al-Sadr, it is now necessary to restore political relations broken 10 years ago between cleric Moqtada al-Sadr And former Prime Minister Nuri al-Maliki. The Arab Post website said the leader said that "Sadr agreed to the proposal of Amiri, the accession of Nuri al-Maliki to the alliance," open "and" Asron "on condition of not demanding the post of Prime Minister of Iraq, and will meet Amiri Maliki, to melt the ice of political differences in order to form the Iraqi government. As for the post of prime minister, the Iraqi official pointed out that Sadr and al-Amiri did not address Najaf meeting to the specific figure for the post of prime minister, but talk about taking Maliki or Amir this position is not true.